A whale has transferred $193 million in btc to a $1 billion wallet. Whats to come? Since yesterday, people have been vigilantly looking for information about a large transfer of BTC, hoping to figure out what the effect on the market will be. Whales, those who hold a massive amount of any cryptocurrency, offer a good metaphor for their effect on the market. Mysterious, rare to see, when they move they cause massive shifts in the medium through which they travel. Follow @whale_alert for alerts on #whales in #cryptocurrency. Where they are moving #crypto to and from. Pretty sweet Twitter bot. While huge movements of Bitcoin occur in cases where major exchanges are moving their funds, and are unlikely to precipitate market shifts, this particular trade involves the movement of 30,000 BTC into an unidentified wallet at the address 3D2oetdNuZUqQHPJmcMDDHYoqkyNVsFk9r. This wallet already contains 168,789 BTC, worth over a billion dollars, and the trade in question consolidated an additional $192 million. What many are concerned about, is that this could signal an institution or huge investor positioning for a dump, a potentially gargantuan sell-off which would drastically affect the market. While these fears are not unfounded, they are only circumstantial. Others have proposed that the trade is merely a routine procedure, for example by a group of investors subtracting a co-investor from their ranks. 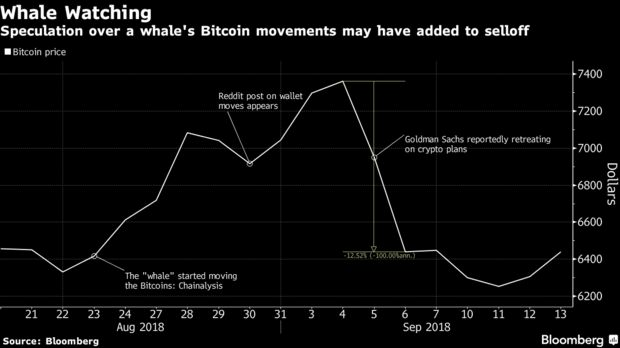 Nonetheless, this huge transfer occurs less than a week after a $1 billion whale sell-off of their assets precipitated or contributed, with fuel potentially added by rumors that Goldman Sachs was dropping out of crypto, to a $22 billion Bitcoin market drop. People will surely be anxiously watching the wallet in question, and its behavior or lack of behavior will surely affect the market dramatically. Does this indicate an imminent sell-off?